1. Go to Admin Dashboard screen -> Appearance -> Themes and click the ‘Add New’ button. Up in the screen click on Upload Theme button. 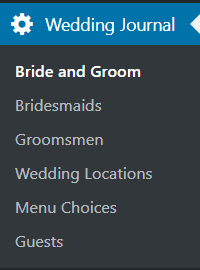 Then click Choose file and navigate to the folder, containing Wedding Journal in your computer (marmalade.zip). 2. Select the zip file and click Install Now button. After this on your screen will appear that theme was installed successfully. 3. Click on “Activate”. Your theme is now installed and active. 4. The first thing you have to do after activating the theme is to install and activate the needed plugins. At the top of admin dashboard you will see a message for all the required plugins. 5. After that you can install the Demo content, which comes with the theme. You will find it in the Demo folder. This way all the sample content will be installed, so you can get a more intuitive idea about – what data from where is coming. To install the Demo content go to Admin -> Tools -> Import and click on Run the Importer. Then select the XML file from the Demo folder ( wedding-journal.wordpress-demo.xml ) and click on Upload file and Import. 6. After installing the demo content, you have to assign menus to their locations, so everything works properly. See the Menus section for more details. 7. Then you have to adjust your Permalink Structure, as the page, category and taxonomies templates are using the permalinks to display correctly. Go to Settings->Permalinks, choose Custom Structure and enter /%category%/%postname%/ in the field. You can also use Post name as your Permalink Structure. Have in mind, that you can’t change the Permalink structure after some time, because this will lead to many not found (404) pages, which is not good for the user experience and your website’s SEO. So, choose carefully your Permalink structure at the beginning. 8. Then you have to add pages and assign page templates. Alailable templates are: Blog, Front Page, RSVP. Here are moved all the Custom Post Types, forms and meta data, shown on the home page. Site Identity, Menus, Static Front Page and Additional CSS are Default Customizer options. In the Site Identity section you can change the Site Title, Tagline and the Site Icon. In the Additional CSS section, you can add your custom CSS styles. In the Menus section you can create menus and add menu items (e.q. links to categories, pages, tags, etc.) to them. After you create a menu don’t forget to assign it to a menu location provided by the theme. This is the Main menu, displayed at the top of the page. Here you can add all bridesmaids information – name, foto, description. Here you can add all groomsmen information – name, foto, description. Here you can add information about the wedding locations. You can add image of the venue, time, address, description. Here you can add the menu variants. First add Dish Types, then Dish Names and at last Dish Ingredients below each other for each menu variant. Here you will find information about guests. To avoid spam, you will have to enter all email addresses of invited guests, separated by comma. This way only people which are invited will show in the table of guests below in the page. The template file, responsible for the design of the Homepage is front-page.php ( wedding-journal->front-page.php ). In this template is included all data, shown on the home page of your website. At admin area – Pages, you can also set this template for a page. Template name is Front Page. Through this form, your guests can sign the RSVP. To be able to send the information, a guest has to be “invited” by the bride and groom. This means his/her email has to be added in the section of invited mails in admin area – Admin -> Wedding Journal menu -> Guests page. At the top of the page you can enter all emails of people you have invited, separated by comma. This is the file structure of Wedding Journal. On left you see the main forler, and on the right are shown the structures of content, css, inc and js folders. In the css folder you will find the files for styling the admin area, as well as css files, responsible for the frontend styling. 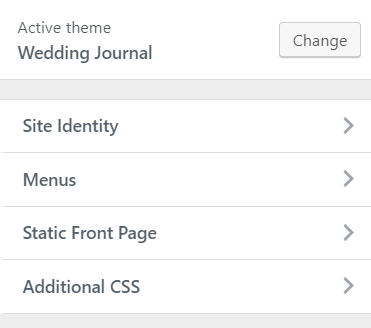 In the theme’s functions, Wedding Journal enqueues only the wedding-journal-admin.css file. The contents of style.min.css is the minified version of style.css. In the inc folder you will find the Wedding Journal plugin.